Disclaimer: This post is meant to be light-hearted and comical in nature. Any commentary that seems rude or unappreciative is unintentional. Growing up, my two sisters and I sang together as a group called “The Smith Sisters.” We did the National Anthem, school concerts, cantoring at church, and even some recorded albums. As we sang more around town, more people began to recognize us. But when the opportunity grew more apparent to take our music further, my parents will tell you that I wasn’t very interested because of the everyday attention that might come with it (assuming we were even good enough for that to happen). I’d rather live my life as a simpleton, get married, become a mom, and keep music as a hobby. Little did I know I would get the next closest thing to fame — triplets. When you have multiples, there’s no covering it up. People will seek you out in public to talk about it. On one hand, it’s frustrating to know there will never be such a thing as making a quick trip out with the kids because we’ll get stopped a million times. On the other, it warms my heart to know that just seeing our girls and our family brings happiness to someone else’s day. You’re kidding, right? 🙂 I’ve concluded that people who ask this question aren’t dumb — they’re just excited to know our story and don’t know how to make an “in.” If you want to know the story of how a parent of multiples found out, just ask. I can’t imagine anyone not wanting to share such a pivotal moment in their life! Who wouldn’t be? Luckily, pregnancy gives you time to prepare. People often say this because they think they’re not capable of handling something monumental. But they are. It’s amazing what we can accomplish when we’re put to the test. Humans have overcome great obstacles throughout history. It’s the great secret of biology and the things that are alive today — we adapt to our surroundings. We make do. We will it to work. Because we have to. You couldn’t imagine something as big as triplets happening to you? Try. 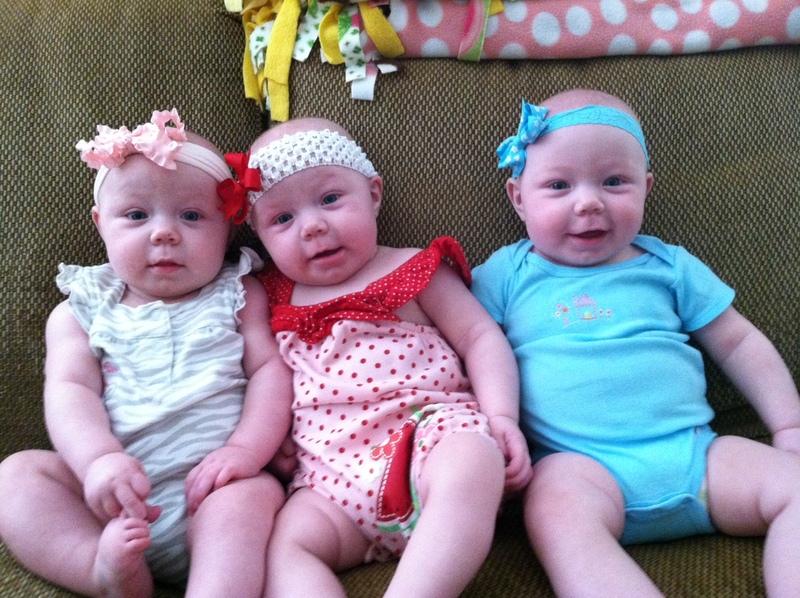 The chances of conceiving spontaneous triplets are 1 in 8,000. The chances of conceiving identical [spontaneous] triplets are 1 in 500,000. Yet, I’ve met so many triplet parents over the last year who make the statistic seem smaller. 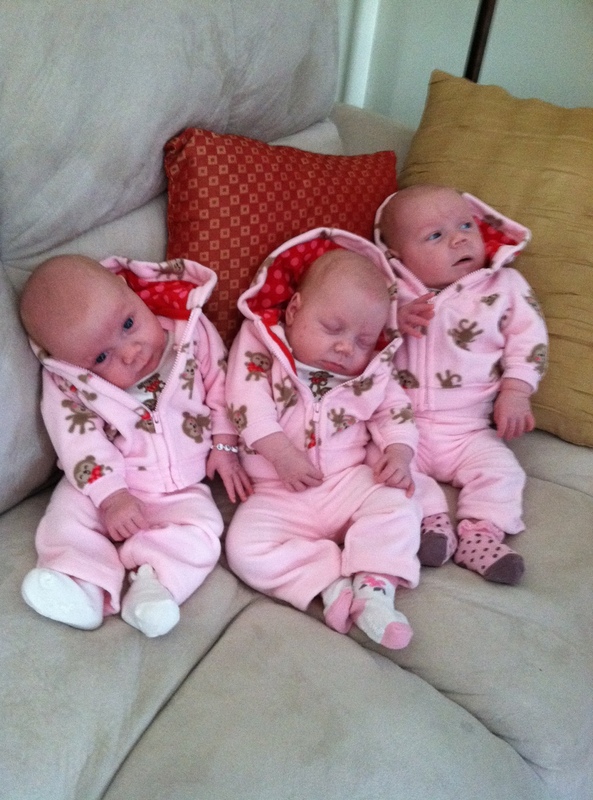 I never in a million bajillion years thought I would one day have triplets or even twins. I never wanted to be a twin mom or anything like it. I don’t like “matchy matchy,” and I didn’t think I had the personality for having a lot of kids. But it happened. I wasn’t exempt. I used to see things on the news and say “that would never happen to me” — but not anymore. I’ve realized that none of us are exempt. God has a reason for choosing each one of us for a specific vocation. And more often than not, it’s something you never even thought about. I never wanted to be a mom of multiples — but it turns out I’m good at it, I love it, and it makes my family unique. I’m sorry……..do I know you? What could be more intimate than a married couple deciding whether or not to try for more children? Considering “where babies come from,” this questions seems to allow total strangers to invite themselves a little closer into your personal life than you might want. Here’s my take: someone who’s genuinely happy for you and your large family wouldn’t even ask this question. Someone who believes you have too many or “just enough” kids already will ask this question to force an opinion on you without explicitly stating it. Now, notice that I’ve used the example of “strangers” here instead of close family or friends. It makes a difference who the “asker” is, doesn’t it? There are things you can tell your close friends that you wouldn’t tell just anyone on the street. Sometimes, this question is appropriate. But more often than not, it isn’t. We’re like tabloid magazines — always moving on to the next BIG thing (Who’s pregnant? Who’s getting a divorce? ), rather than just letting the things in the moment simmer. Instead of worrying about what my family could look like, help me celebrate what it is now! I physically wince when I hear this now. This is by far the top comment we get as triplet parents. In the weirdest phenomenon I’ve ever seen, somehow everyone in the world is privy to the same obnoxious phrase. What kills me is that it isn’t a question or even a statement of value. It’s merely an observation that we’re forced to respond to affirmatively somehow. Funny enough, we only seem to hear this when our hands are physically not full — the girls are in their strollers, quiet and calm. 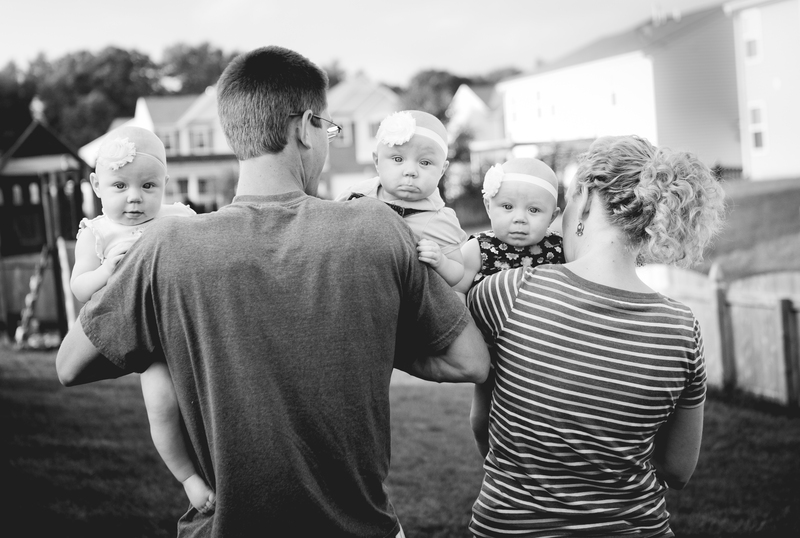 The truth is, (and I’ve said this in blog posts before), having triplets isn’t exponentially harder. You work more efficiently as a parent of many, which makes things much easier. It also just becomes a way of life. So while it may be daunting for someone who doesn’t live it everyday, it’s not for someone who does. Luckily, I met someone recently who gave me a perfect response to this statement. When someone says “you’ve got your hands full,” all I need to respond is “then you should see my heart.” What a perfect sentiment to describe how it really feels to have multiples. This blog post is not a rant. It’s not a venting session. It’s not an opportunity to make others feel bad or make our lives as triplet parents seem more important. It’s merely a glimpse into our lives (as this whole blog is) and the things we hear and see everyday from the people and happenings around us. It’s an opportunity to educate. We’re all human — and we can all fall into the trap of asking silly questions when we don’t know much about the topic at hand. The next time you meet someone with a unique story — they have multiples, they’re from another country, they have a deformity, or something else you’ve never encountered — think first about what you want to ask, uncover what it is you really want to know, and consider how you’d feel if you were in their shoes. It might lead to more interesting conversation than you originally thought! No, I didn’t die. I didn’t go missing. I didn’t delete the blog. 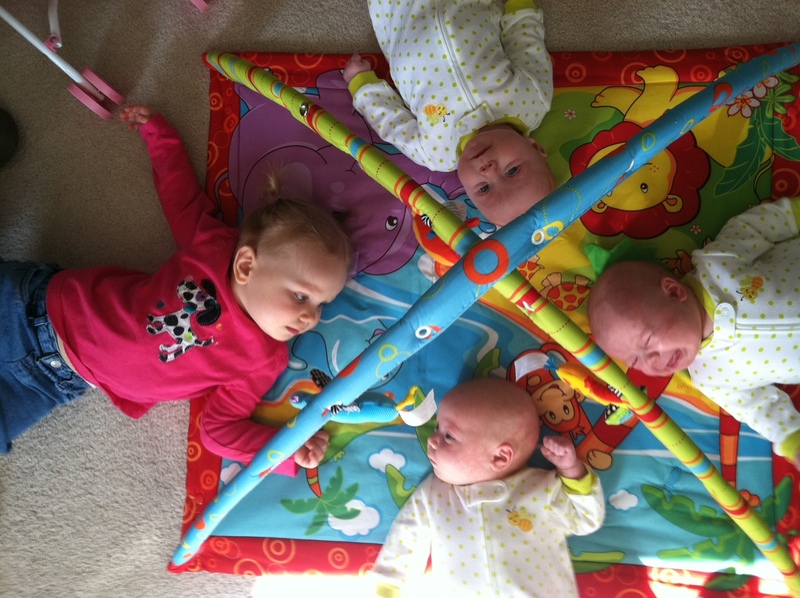 I’ve just been……….well, living life with four little ones. 6:45 a.m. – Triplets get up. Give bottles, change diapers. 6:00 p.m. – Home. Eat dinner while trying to entertain triplets in highchairs. A lot has happened since the last time I wrote. Namely, Greg got a new job! He is now just around the corner from our house, teaching 7th grade science in our hometown school district. The [lack of] commute, the easier school schedule, and the overall demeanor of the school and district have been a blessing for Greg. Coming back to our alma mater was something we both wanted for our family — and though it happened earlier than we had planned, it’s proved to be an excellent decision. I’m so proud of Greg for landing his dream job! We also said goodbye to our amazing nanny, Meghan, as she headed off to grad school in Michigan. We’ve missed her a lot and were nervous about finding another nanny with as much patience, kindness, and comfort around kids as her. But after some deep searching and asking around, we found our new nanny, Nina. 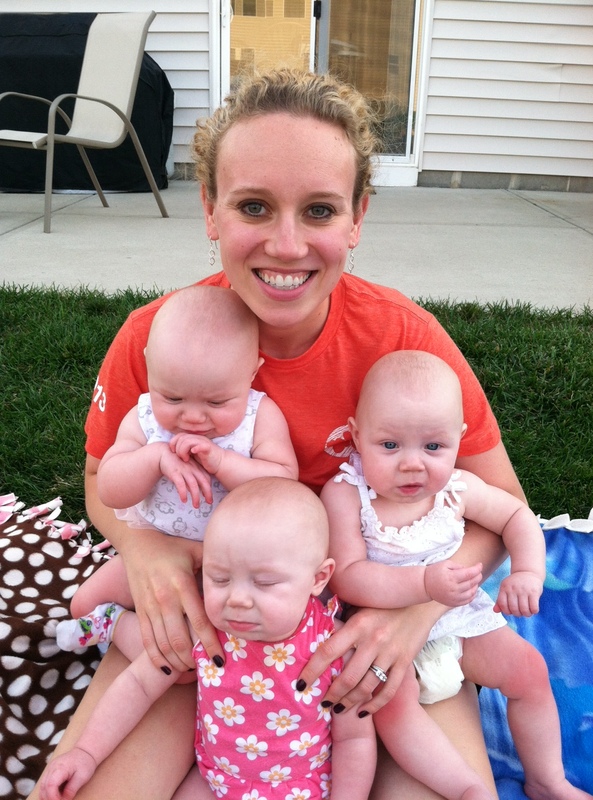 Nina is a former daycare owner with a ton of experience around kids — even multiples! We were thrilled to find her and to learn that she couldn’t wait to care for triplets. So far, Nina’s been with us for a little over a month and she’s taught us and the girls so much. 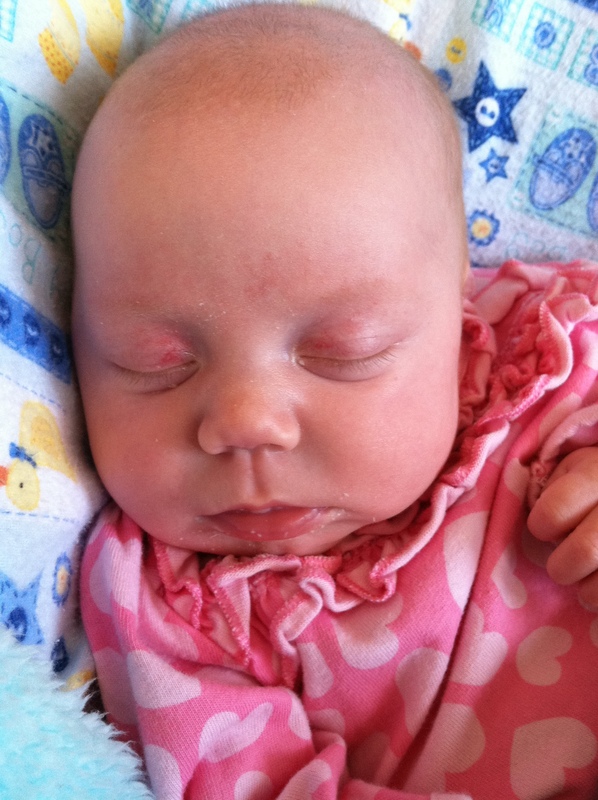 She’s helped us ween off of bad habits with the girls (rocking before nap time, streamlining eating schedules, etc.) and implemented curriculum with Hannah. 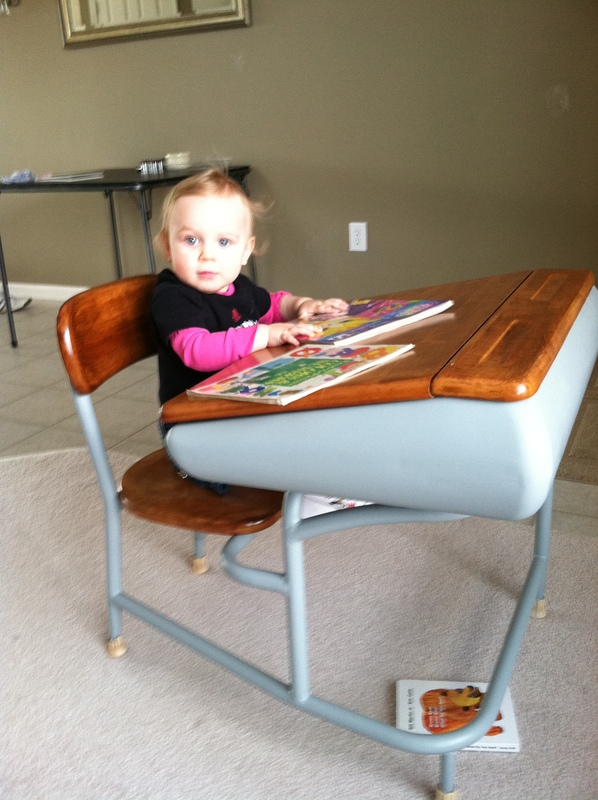 I’m so excited for Hannah to have one-on-one learning time! The girls themselves have also changed quite a bit. 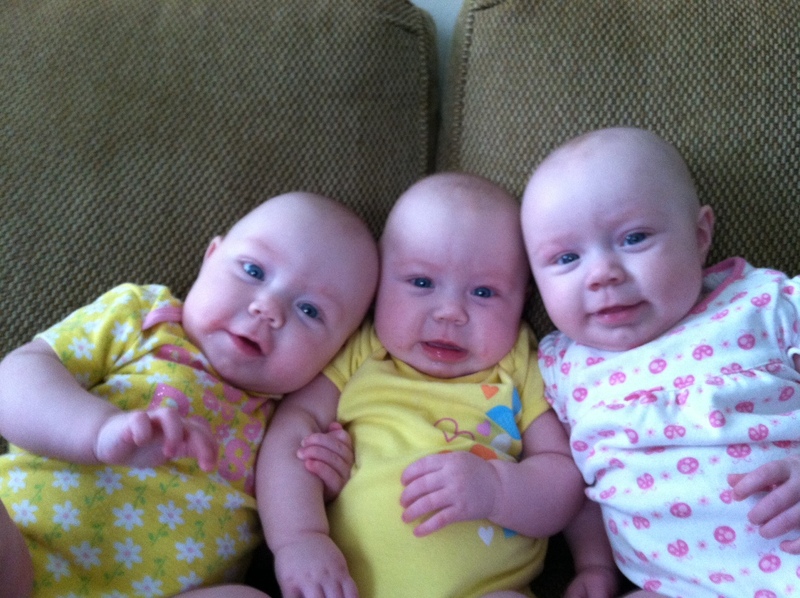 The triplets are now 8 1/2 months old and are crawling around like crazy. They’re constantly squawking and babbling. They’re pulling up to a stand every chance they get. They’re starting to eat table foods. And most importantly, they’re sleeping about 11 hours through the night! We’re at that stage in their development where things are fun and they only get better each month. It’s still a lot of hard work (they all whine for quite a bit of attention and aren’t sure-footed yet when standing, so they scream for help), but the rewards of smiles, laughs, new expressions, and sounds make it all worth it. It’s amazing to me to see how happy we are today and compare it to where we were just a short year ago. I was coming off my morning sickness and still wasn’t sure how to feel about the pregnancy. We were trying to sell our house and looking for a new one. Hannah was getting bigger. I was getting bigger. Greg was starting school. 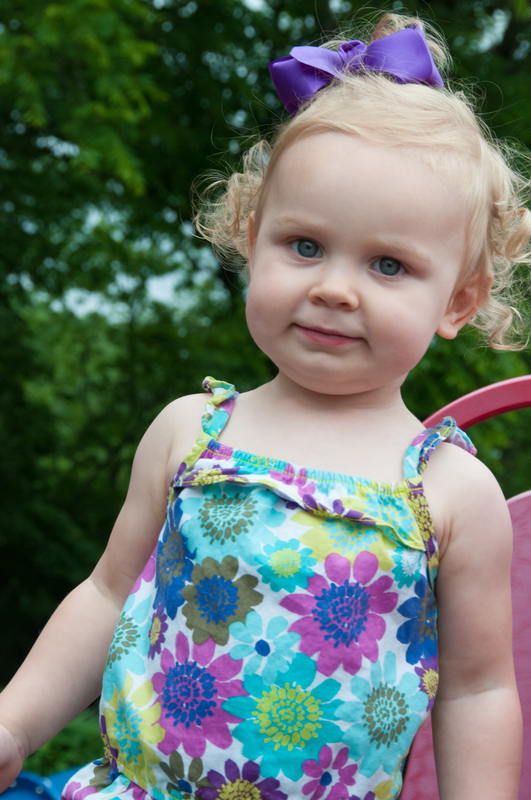 Who knew that just one year later, we’d be basking in the summertime with our sweet little girls and juggling the day-to-day lives we’ve become accustomed to? We can’t help but look into the future and imagine all the fun that lies ahead. 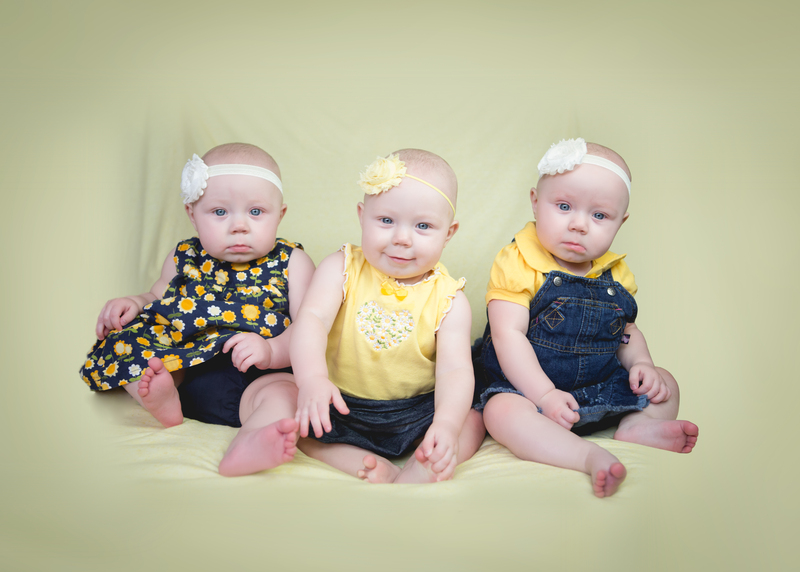 We also had the triplets’ 6-month pictures taken (ok….7-month pictures. 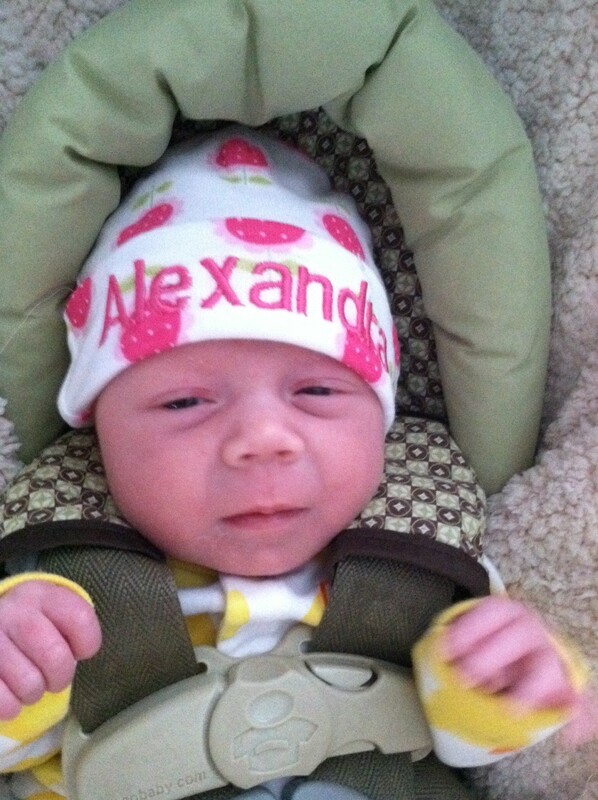 Mommy was a little late in scheduling. 🙂 ) Greg and I can’t stop flipping through them. What little ladies! 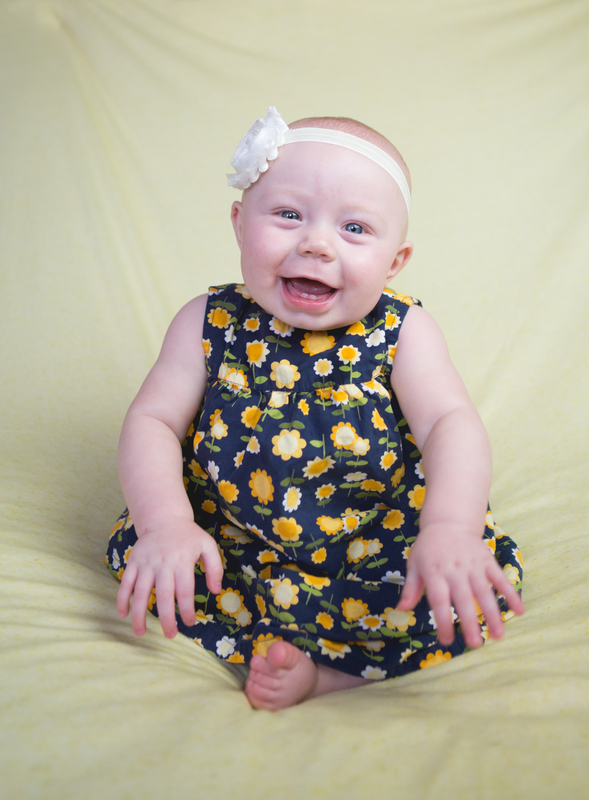 Thanks to our “official family photographer,” KristeenMarie Photography, we got some beautiful shots showcasing each of the girls’ personalities — even Hannah! 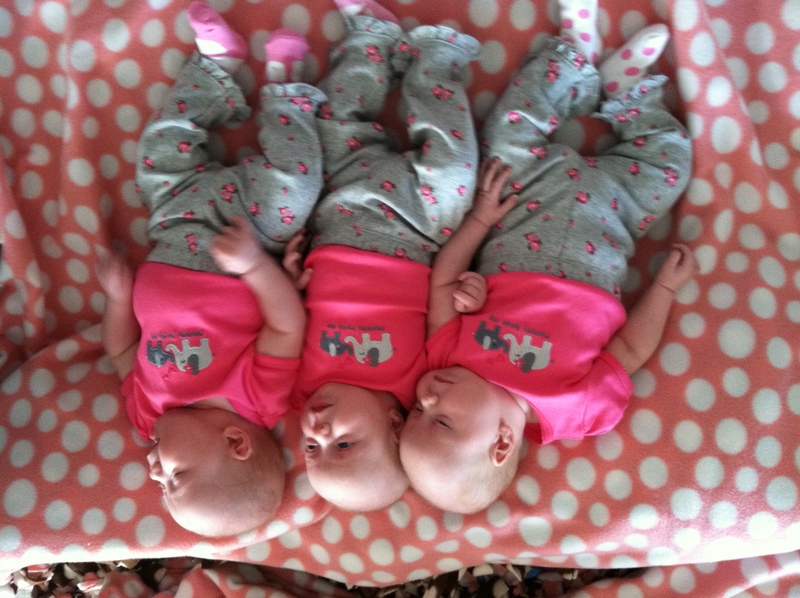 I even sent some of the photos to our former NICU nurses and Dr. Dunlop so they could see how the girls have grown. I hope it’s fun for them to remember us and see how the girls have grown this year. 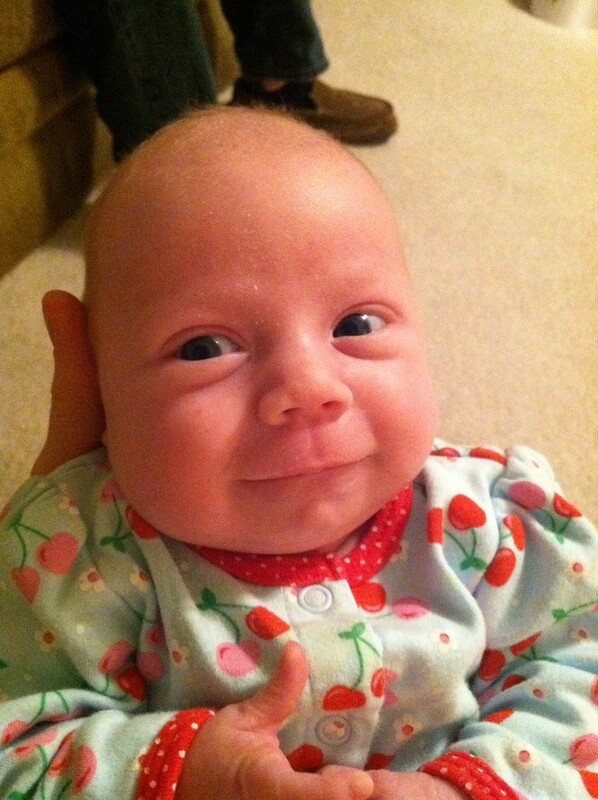 A visit from Aunt Jenny and Uncle Chris! Lastly, I want to give a shout out to my triplet mom friend, Sarah. I’ve never actually met her in person, but we have a mutual acquaintance and have communicated over Facebook about our kiddos. 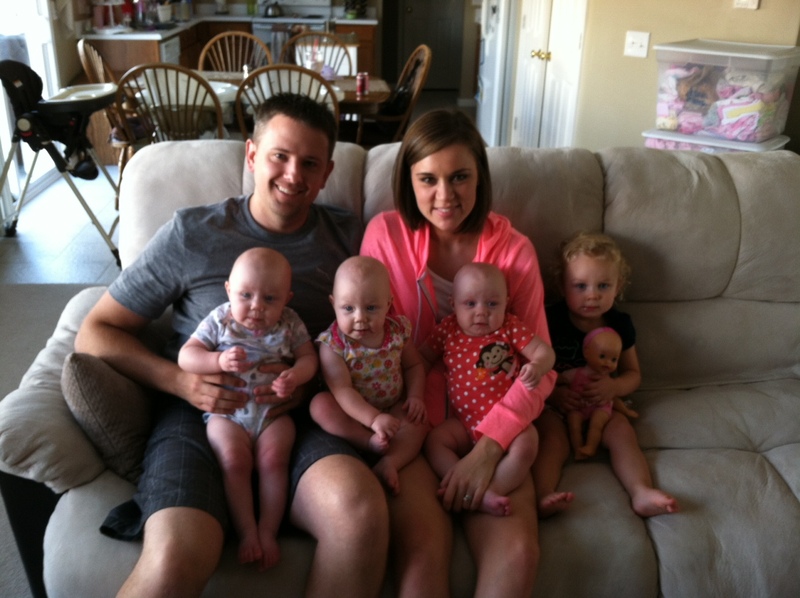 Sarah and her husband have four, just like us — a toddler and younger triplets — but all are BOYS. They’re a few months ahead of us in age, so it’s been fun watching her boys grow up and see what we have to look forward to. Just a few weeks ago, I came across an update from Sarah. She’s expecting again! And guess what? 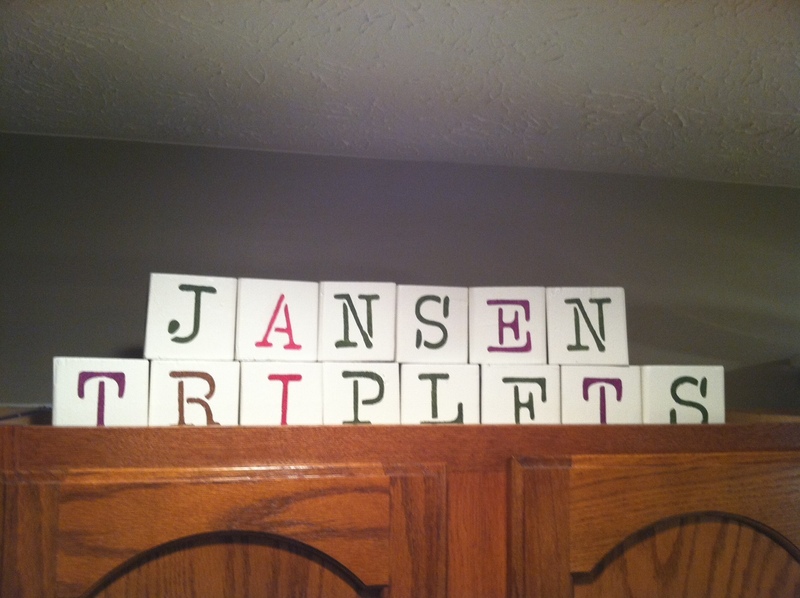 It’s triplets…….again!! I was astonished. Knowing what a triplet pregnancy is like (the physical strain, emotional ups and downs, and overall preparations), it all came rushing back to me. Sarah, if you read this blog, I want you to know that I haven’t stopped thinking about you and your family since I read your news. 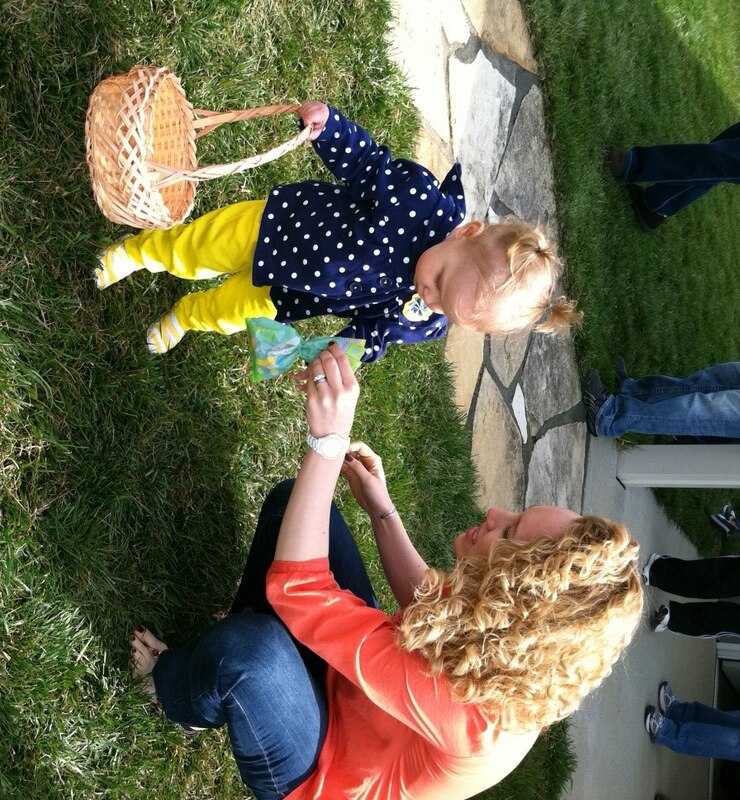 You’re an inspiration to moms everywhere, and I’m so impressed by your will to “do it all” for your kids. It’s clear that you value life, and despite what others may say about having a large family today, your commitment to your family is something to applaud. Congratulations and let me know if you want any pointers on those three GIRLS!! This weekend will be the one year anniversary of the day I found out I was pregnant with triplets. I remember that day clearly. It was beautiful, and I was getting ready for my first pre-natal visit to my new OB on the West side while Greg was getting Hannah ready for an appointment of her own. Greg wouldn’t be with me to hear the big news. We had known I was pregnant for a few weeks. 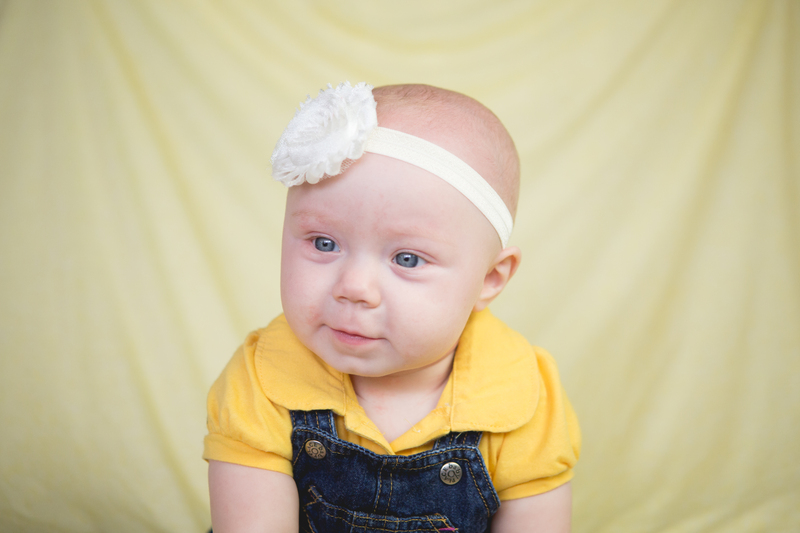 Sickness and migraines had set in almost immediately, unlike my pregnancy with Hannah, which took a little longer to progress. Little had I known, my hormone levels were through the roof (three times the average to be exact), causing the excessive nausea. I wasn’t exactly excited about being pregnant again. After all, I had a seven-month-old at home. But I had done a lot of thinking those first few weeks and had finally come to a place of acceptance. But that was about to change. The technician began the ultrasound and paused. Calmly, she asked, “Are you on any fertility treatments?” I wanted to laugh. 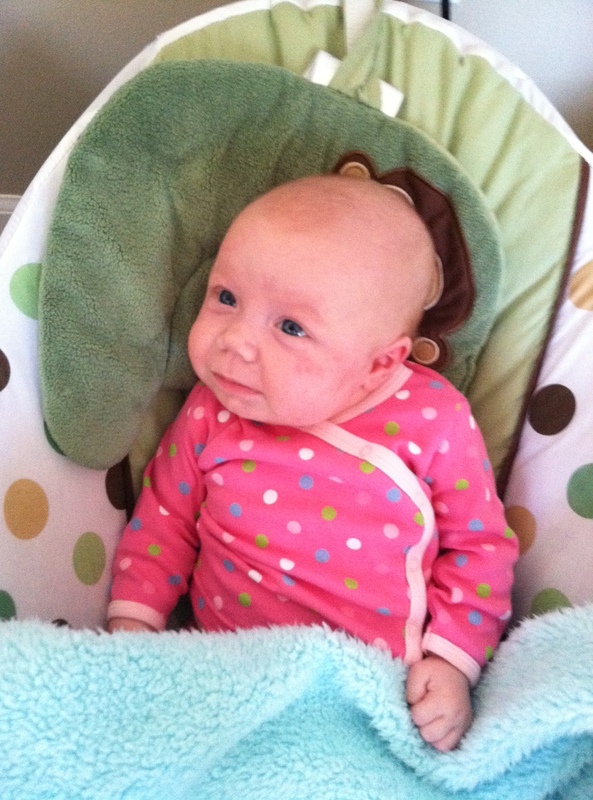 Why would I be on fertility treatments when I have a baby at home? But then it dawned on me—why would she be asking me that? 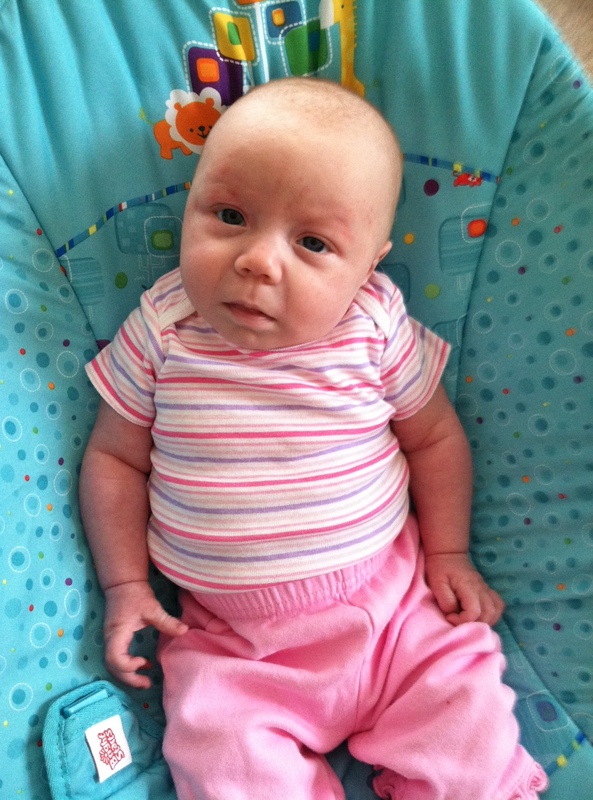 She would only be curious about fertility treatments if I was having multiples. Of course, I was aware of the fact that twins run in my family, so I had known that was a possibility. In fact, I remember asking the ultrasound tech “there’s just one in there, right?” when I was pregnant with Hannah. My heart jumped. “Twins?” I asked. “I see three,” she said. People ask us all the time – “Were you shocked?” We always have to chuckle at such an obvious question. Yet, I’m not sure “shock” is quite the word to describe what I was feeling. It was like a dream sequence. That feeling when you’re scared, but you know it’s a dream and just keep praying to wake up. That’s what it was like – a dream. “There’s no way this could happen to ME,” I thought. Nothing out of the ordinary ever happens to me…. I’m assuming the ultrasound tech was expecting me to be shocked, but my negative reaction prompted confusion on her face. I quickly explained my situation – the migraines, the sickness, the fact that I had such a young one already at home. She got it, but in the moment, I was upset with her (though, of course, it wasn’t her fault). She could say anything she wanted to me. “It’s going to be ok.” “Congratulations.” “Hang in there.” But at the end of the day, she would get to go home and continue about her life. I, on the other hand, had a lot of work to do. The rest of the appointment was a blur. I’m sure I was less than cordial to the other nurses and doctors who saw me that day. I kept hearing new words like “spontaneous” and “placenta,” and didn’t understand yet how they applied to my situation. I’m old fashioned when it comes to sharing baby news. Always face-to-face, nothing less. With Hannah, I had even done it in a cute, creative way. But there was no time for that now. Was Greg shocked? Of course. But I’ll never forget the smile and chuckle that registered on his face too – the trademark of his happy-go-lucky nature, which set the precedent for his positive attitude throughout the pregnancy. From there, we got started planning. Greg rushed upstairs to start looking at houses on the South side. We called our parents and told them to come up to the house that Sunday for some important news. We even had plans for friends to come over that night. Of course, there was nothing else on my mind but the triplets, but I had to keep going like everything was the same. And that’s how I remember it. The day that changed my life forever. You may sense a negative undertone in my account, and that would be correct. But what’s so great about it being “one year later” is how happy we are now. This morning, I sat in the rocking chair with Hannah in my lap, the triplets on their respective play mats and bouncers, and the sun beaming in while experiencing a feeling of happiness, tranquility, and equilibrium. Time is a funny thing. 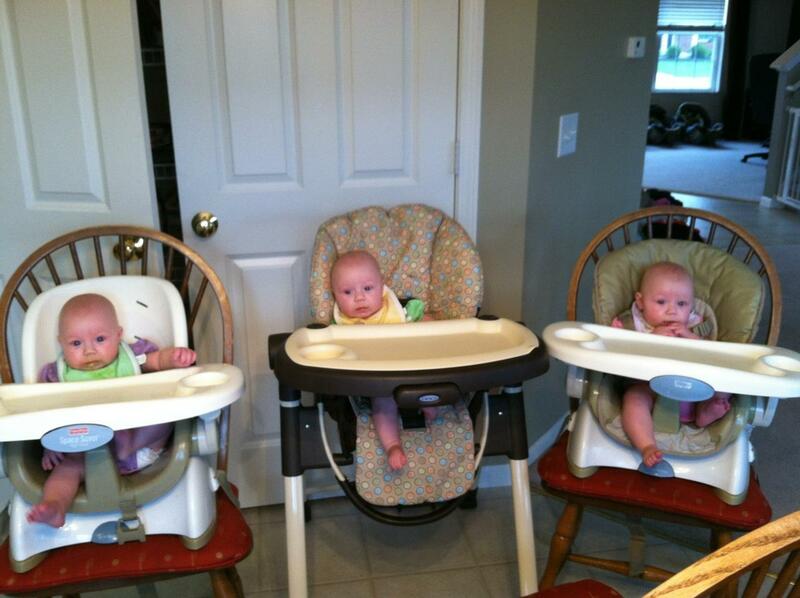 In fact, today is the triplets’ six-month birthday. 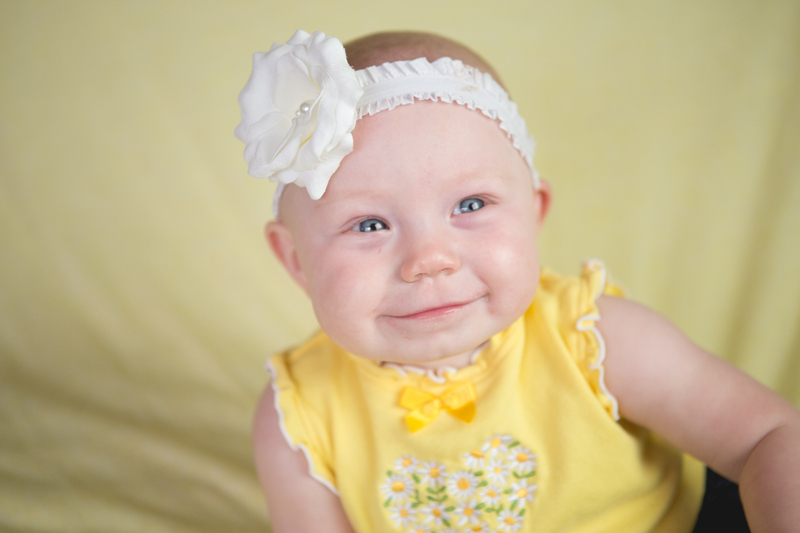 In that moment of fear and shock when I first found out about the babies, I never could’ve imagined one year later, when the girls would be six months old, eating solid foods, ready to sit up, and squawking up a storm. 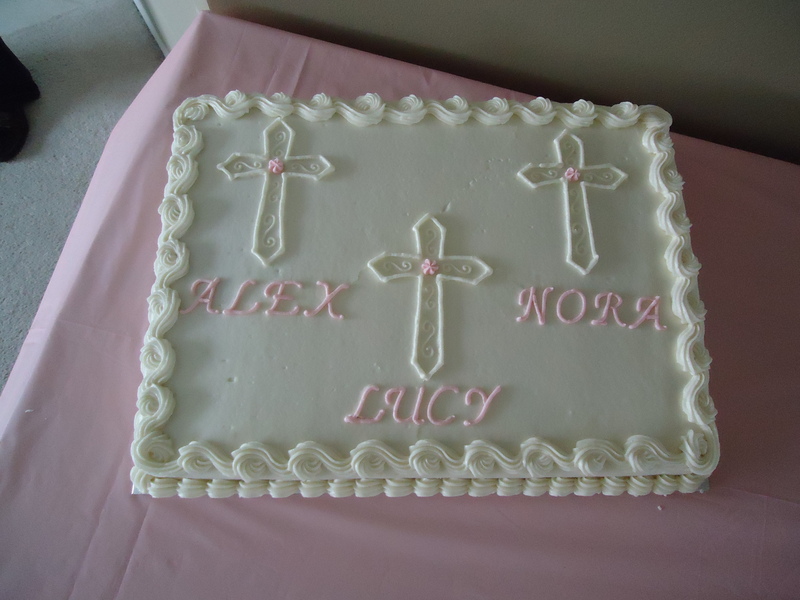 Happy six months to my beautiful Alexandra, Lucy, and Nora!! I love you and am honored to be your mother. We’ve been through a lot this past year, but I can’t wait for what’s ahead. You are true miracles! This time of year is an interesting one for me. For the past two years, I’ve spent my Spring/early Summer in the first weeks of pregnancy. And you know what that means — nausea, migraines, fatigue…the classic symptoms. I have a new outlook this year, ecstatic to spend an awesome summer with my family. 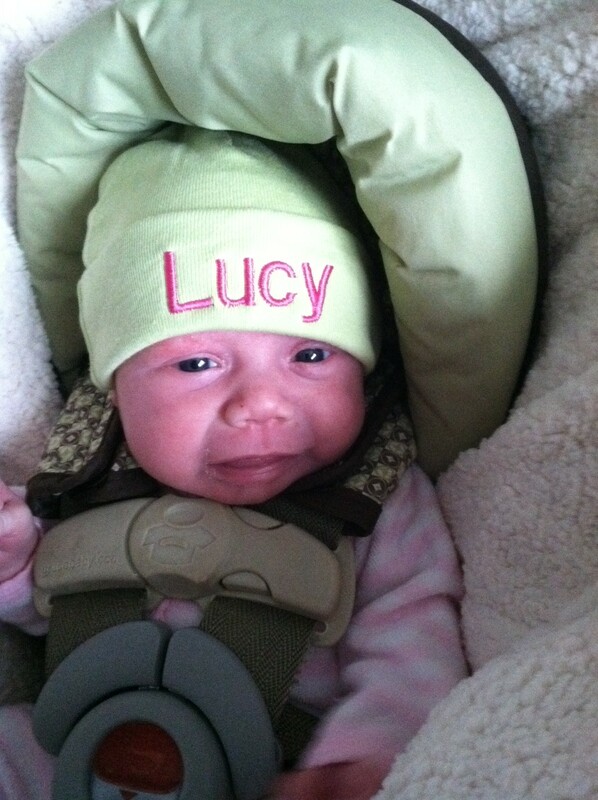 One year ago this week was when I found out I was pregnant. Granted, I didn’t know at that time that it was triplets, but it still took me by surprise. Thus, I’ve been reflecting this past month on what life was like a year ago and how things have changed in that short time. It’s amazing how life’s biggest challenges and tough times can work themselves out to the point that you’re happier than you could’ve ever dream just a year later. But I’ll spare you the nostalgia. After all, I know you read this blog to hear about the girls!! So, what have we been up to? A lot, of course. 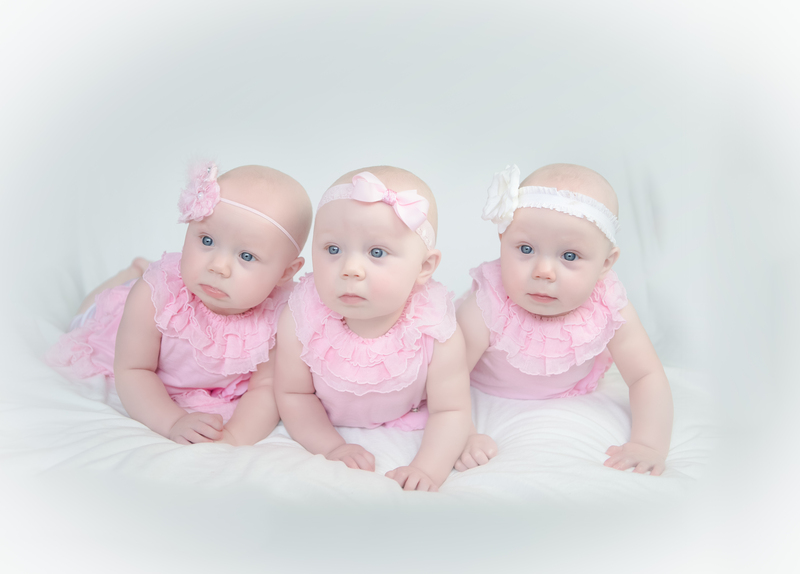 Here we go: the triplets turned 5 months old. Hannah turned 18 months. The babies hit about 13 lbs. each. Greg got me a Coach purse (my first!) for Mother’s Day. We bought two double strollers (off of Craig’s List for great prices!) to make walks around the neighborhood easier. We mustered up the courage to go on our first restaurant outing with the triplets. Greg and I had the chance to get out for a night to attend a Great-Gatsby-themed birthday party. 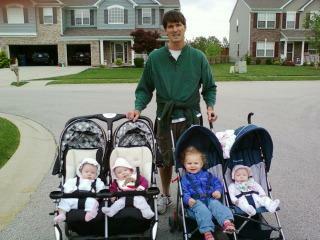 Our nanny, Meghan, helped me haul the girls up to Ben Davis to visit Greg at school. I accepted an extracurricular position at work as Co-Lead of our internal Moms group. 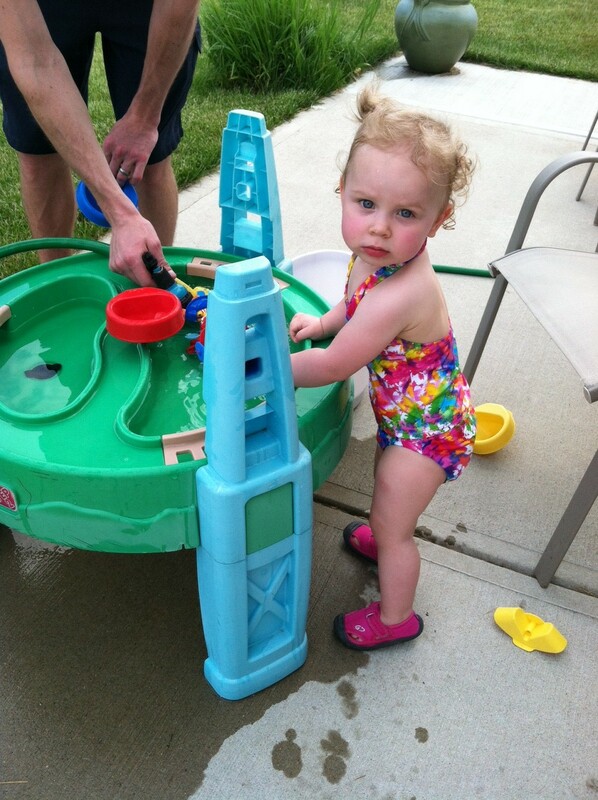 We got the blow-up baby pool and water table out for Hannah. 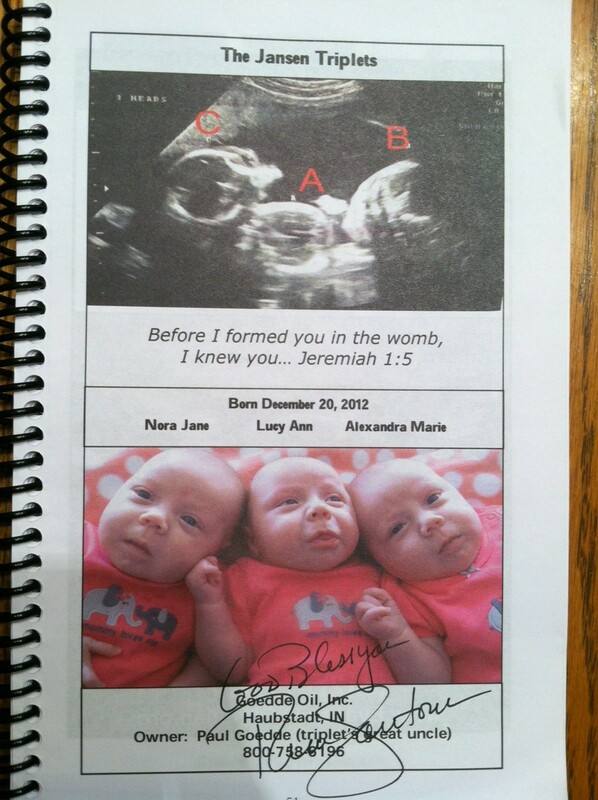 The triplets were featured in a pro-life ad for the Right to Life of Southwest Indiana program guide. We finally got the chance to get outside in the nice weather, meet our neighbors, and do some landscaping! I’m not gonna lie, our days are busy. And I don’t mean that in the way that most people casually say they’re busy. I mean that I’m CONSTANTLY moving. I’m constantly trying to increase my productivity. No minute is wasted. It’s funny talking to some of the other moms at work — when you’re a working mom, you know that you only have a certain amount of hours to get things done before you have to leave, so you use them wisely. Work has actually become “me time.” It’s where I get to do the things I like, interact with other adults, eat my lunch in peace, and use my mind for something more than divvying up ounces of formula. 🙂 But by 6:00, I’m home to scarf down dinner so we can be ready for when the babies wake up soon after. The next couple hours are usually filled with cleaning up dinner, playing in the loft, or taking the girls on a walk. From there, we do one last feeding and spend a good hour and half trying to get the girls to sleep. (They’re extremely well-tempered compared to most, but for some reason, evening hours are a struggle!) By the time all the kids are asleep, Greg and I have about one hour to ourselves. I usually spend it cleaning, making my lunch for the next day, cleaning, organizing, paying bills, cleaning, catching up on emails, or….did I mention cleaning? It’s like an endless battle — I could be picking up clutter and Hannah would be right behind me, making more mess. 🙂 But such is life with kids. I suppose I don’t mind clutter as much as dirt, and that’s what I mostly try to tackle by the end of the day. And if the girls don’t wake us up in the middle of the night, we wake up at about 6:30 the next morning to do it all again. As if the girls don’t already have enough drool and spit-up on their faces (sorry — gross, I know), we’ve added avocado to the mix! 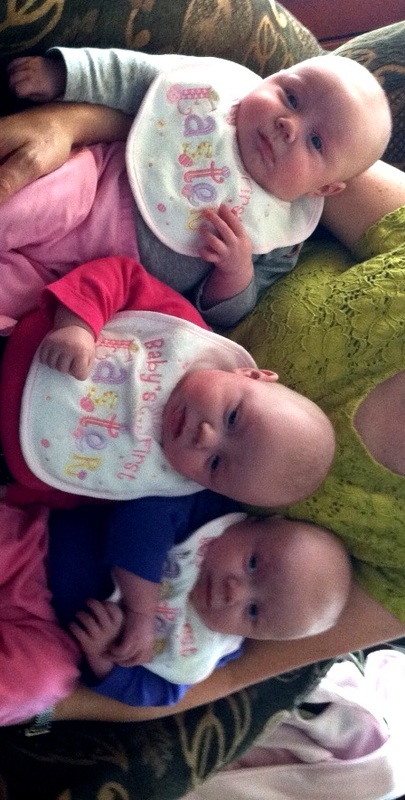 The triplets had their first experience with solid food the other night. And it was successful! They’re really doing well picking up on eating. 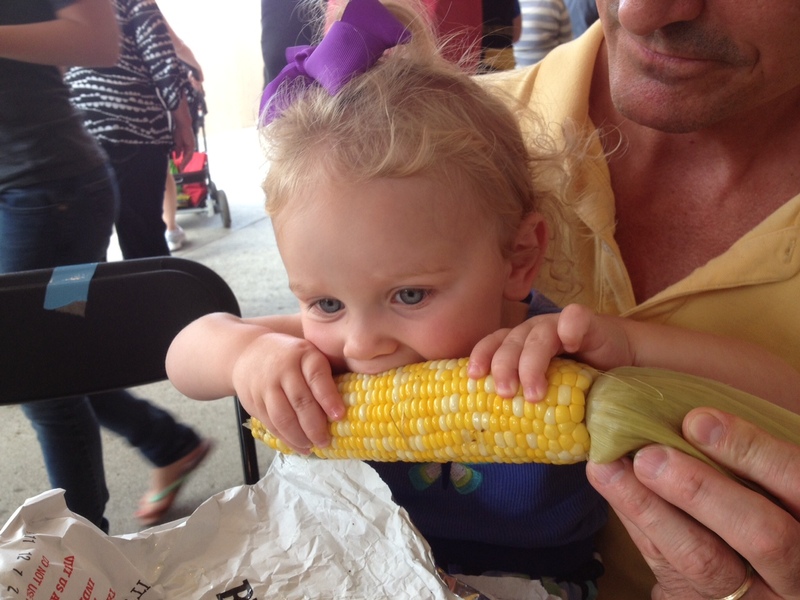 Surprisingly, our best eater is little Lucy! 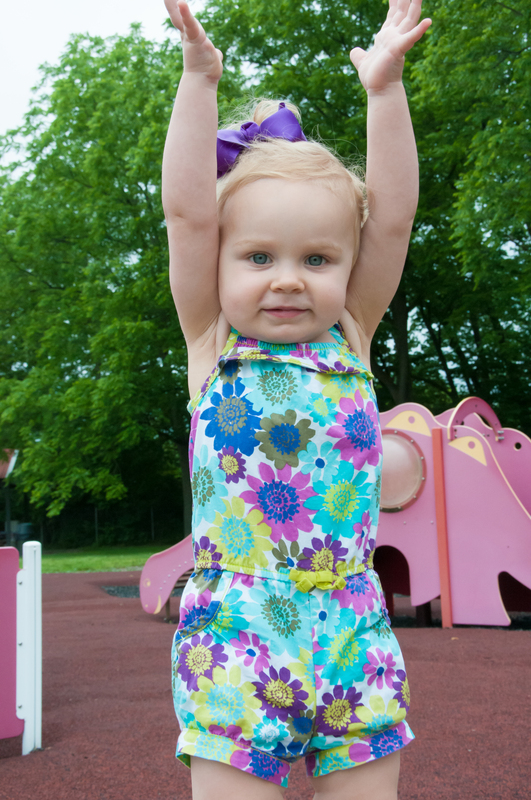 It’s amazing how far she’s come — once the smallest one, she’s now caught up and progressing so well developmentally. Hannah’s been a ton of fun lately too. 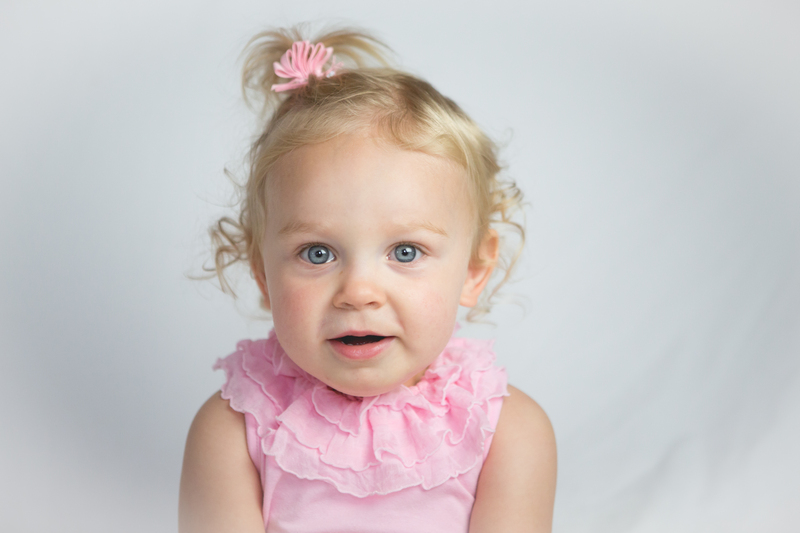 We were so excited to spend some time with Greg’s brother, Ben, over the weekend as he tried his hand at her 18-month pictures! Informal and low-key, we just went to the local park to take some fun shots of her playing. Of course, we got some heart-melting pics. 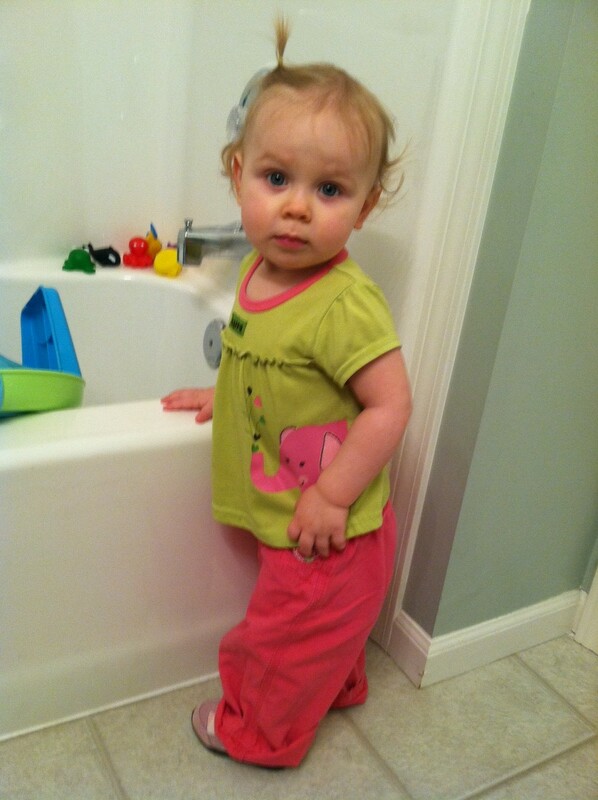 My little girl is growing up! Especially excited for this month because I get to go on a personal vacation up to Minneapolis to visit my sister and brother-in-law! Can’t wait to get some one-on-one time with them that doesn’t include wrangling children while trying to have a conversation. Also excited to see their place (I’ve never been) and feel what it’s like to be on my own again! It will be an interesting feeling, and I know I’ll really miss the girls and Greg, but I’m super excited! Lastly, I wanted to extend a huge CONGRATULATIONS to my sister, Lindsay, and her new FIANCE, Tony, on their recent engagement!!! Our whole family is giddy for another wedding, and I know I’m personally so excited to have another member of the family. I’m especially looking forward to taking our girls to the wedding next summer (it’s weird to think the triplets will be older than Hannah is now) and boogeying down! Returning to work. Making the transition back to work has been a tremendous success. I’ve already been back five weeks now, and I’ve found my stride again. I couldn’t have been welcomed back more warmly by my co-workers. I LOVE dressing up every day, going into the office, getting stuff done, and then rushing home to see my family. 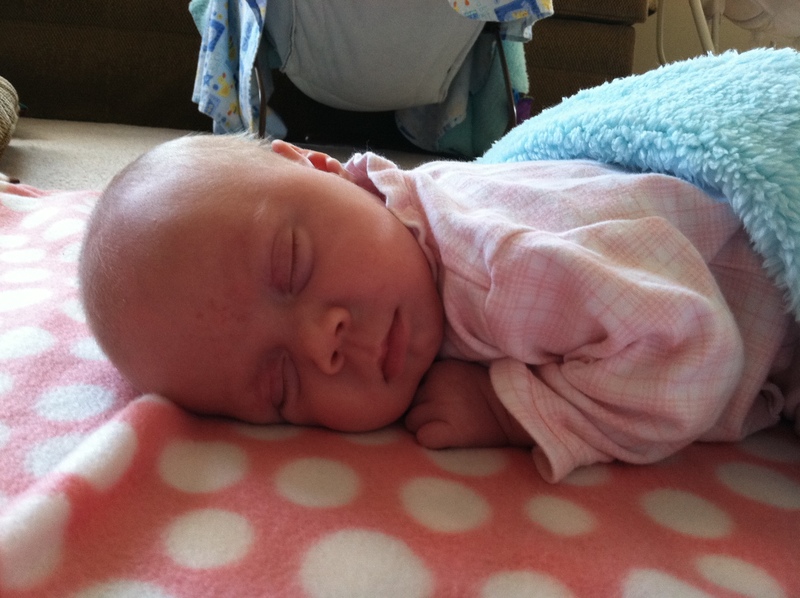 The first couple weeks took some adjustment in terms of child care (doing feedings before work, adjusting schedules, knowing how many care givers need to be with the girls at all times, having to do a feeding right as we come home from work), but it’s all evened out. I’m also happy to announce that I’m now on a 4-day work week! My amazing boss and company have been so supportive in letting me transition to a work schedule that’s better for my family, but still allows me to be considered a full-time employee. I love being able to put all the girls’ appointments on a single day so I can focus more at work and not have to take time off or come in late to accommodate for other things. It also gives me time to just be with them and bond in a way that’s not over a rushed weekend. Many thanks to our awesome nanny Meghan J. and our amazing caregivers and helpers, Grandma “Ree” Smith, Grandma Jansen, Diane D., Great Grandma K., and Barb J. Parents thank you dinner. Our parents have done so much for us since the day we first told them we were having triplets. But with so many things to do until the babies came and then getting through the delivery and holidays, it never seemed like the right time to appropriately thank them. So finally, now that the girls are a little easier to care for and we’ve got some time back in our schedules, we decided to host a nice dinner for all four parents, complete with cornish game hens (fancy, huh? ), wine, and a “babysitter” (my sister Lindsay) for the girls while we enjoyed a cry-free, stress-free dinner downstairs. The night was lovely and we all had a chance to reflect on the past year and all that had happened. It was rewarding to be able to celebrate with those who had been there with us since the beginning. Other than those specific events, the girls have also become much more alert in the past month. They coo and smile non-stop and are starting to sleep less through the day, making for more play time. 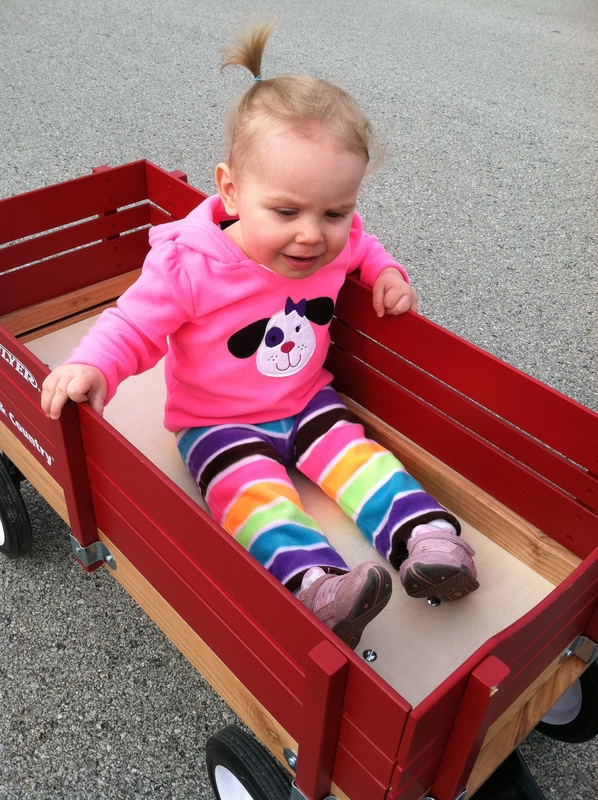 Hannah can’t seem to get enough time outside, so we’re thankful for beautiful days where we can take her on a walk in the wagon or play on the swingset. Unfortunately, Indiana weather is such that one day, it could be 80 degrees and humid, and the next, it’s 30 degrees and flurrying. Thus, we’ve had to get creative with activities for those “inside days” to keep her entertained. All in all, we’re loving life. Don’t get me wrong — there have been quite a few days when we’ve both come home tired, only to start our “second shift” in taking care of the girls. By bed time, we’re exhausted, but so deprived of personal time that we ignore the tiredness for just a little time to watch some TV or catch up. But the trying times are forgotten quickly and the good times are the ones that are remembered. Right now, we’re giddy in anticipation of summer, where we’re hoping to get a lot of pool time with the girls, take Hannah to Holiday World, and have some FUN! Being pregnant the last two summers in a row, I’m personally looking forward to some sickness-free fun in the sun! 🙂 We can’t wait for the girls to get to the point where they’re sitting up, holding their own bottles (oh yeah), and enjoying their surroundings. And guess what? That’s only a few months away! I never could’ve imagined this moment — the night before returning to work from maternity leave after having triplets. 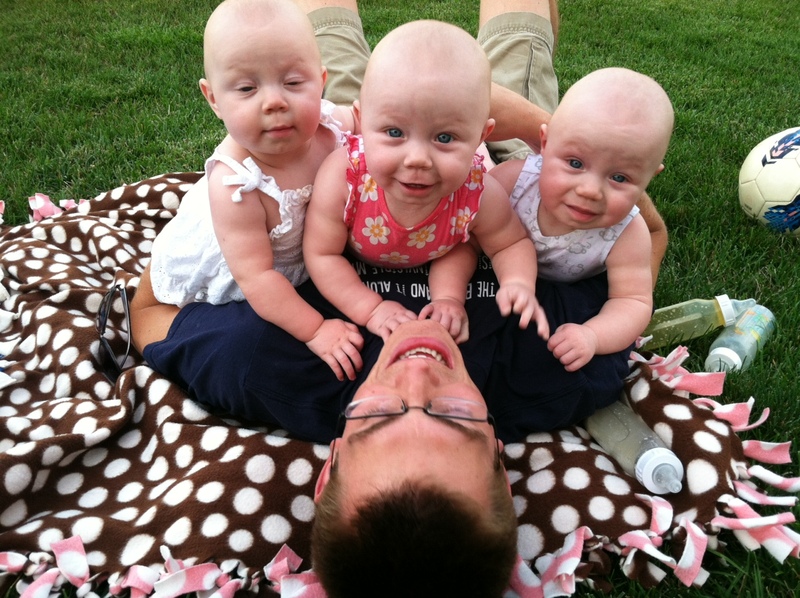 I have vivid memories that I’ll never forget from the day I found out I was having triplets. A million things flashed through my mind, and from there, a series of events and planning began — tell our family, find a doctor, sell our house, buy a house, tell work, move, prepare the house for babies, prepare for birth, get help lined up, prepare for bringing them home, spend the next 12 weeks getting to know them. It’s been a long journey. But in all that time since that unforgettable day in June, I couldn’t imagine the day I would go back to work — the day all the preparations and “pre-work” would be over. Tomorrow starts a new chapter — the day the girls stop being newborns and start growing up. It marks the time when we start getting into a routine as a family and living our lives. The novelty has worn off. It’s time to get back to reality! All four of my kiddos. There’s no doubting the power of prayer. 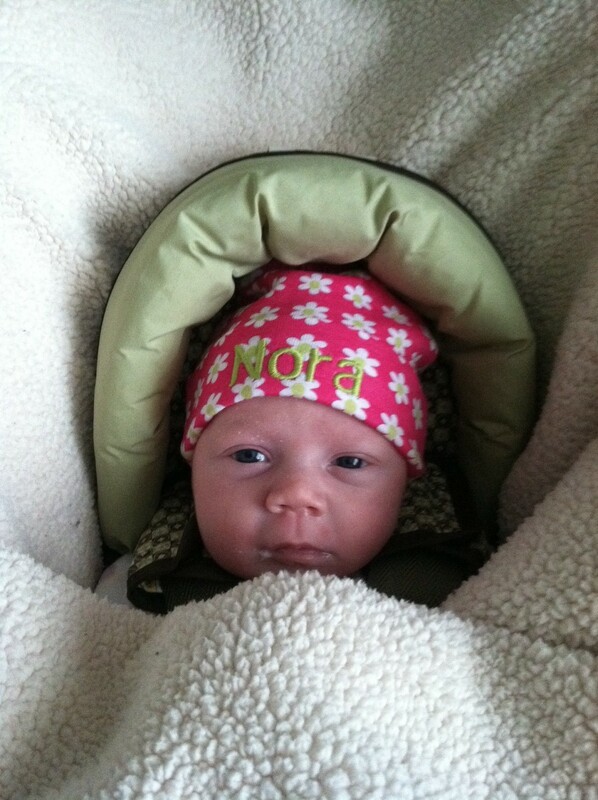 Swaddlers are the greatest invention since sliced bread. A good nap goes a long way. Everybody needs a little “me” time. Spouses can accomplish a lot when they work as a team. Brand name formula, diapers, and detergent are overrated. 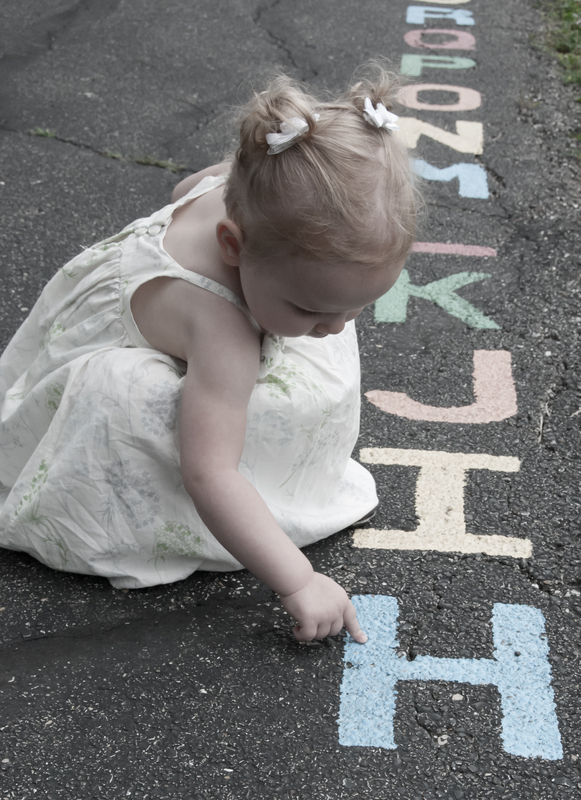 Anyone can become ambidextrous if they just spend a little time around triplets. A situation is what you make of it. When I was pregnant, the number one question people would ask us after learning we were having triplets was “how are you going to do it?” It would frustrate me because after overanalyzing it (a common trait of mine), I would assume that meant that people thought we couldn’t do it. Over time, I started questioning myself, wondering “will I ever have a free moment again?” “Will I ever get to enjoy a meal or a hot shower again?” “If they all three start crying, am I going to break down in tears?” I remember discussing this with Greg just before the girls were born and he assured me “we’re different.” Just because we hear it will be difficult doesn’t mean it has to be. And he was right — bottle making is easy because we took the time to set up a “station.” Our girls sleep well because we’ve been diligent about routines. 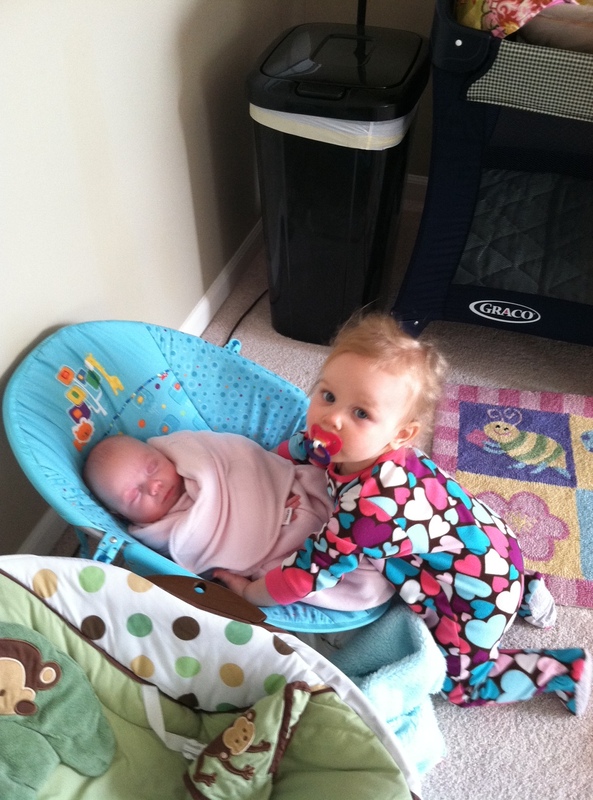 Hannah interacts well with the babies because we’ve taught her how. We haven’t pulled our hair out when times were tough because we held each other up and learned how to be patient. 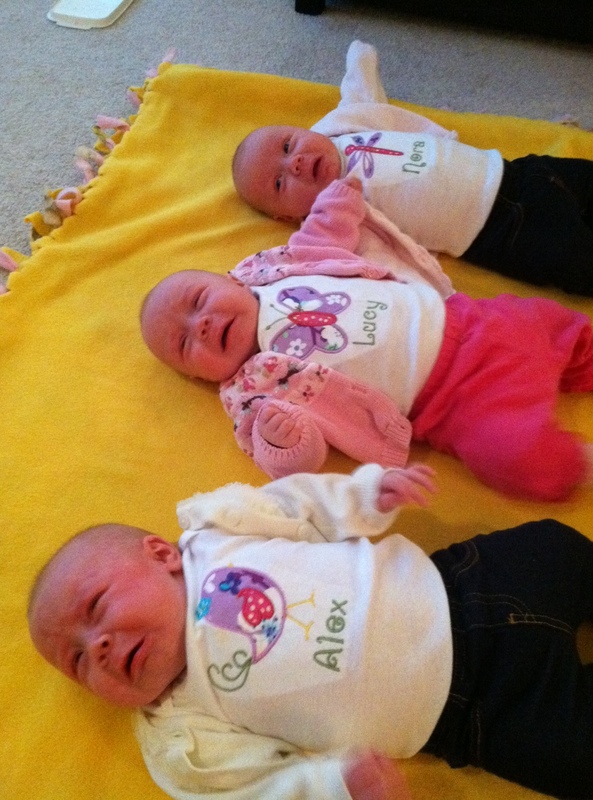 Name shirts aren’t just cute….they’re helpful! I’m not saying things weren’t rough — we certainly had our share of trying times these past 12 weeks. But they weren’t as tough as they could’ve been because we were determined to beat the norm. The same thing happened at our wedding. People told us the day would fly by, we’d be stressed out with all the different activities, we wouldn’t really have a moment to enjoy ourselves, and it’d be over before we knew it. But we made sure to keep each other in check and take moments to just stop and look around. Because of that, it was the perfect day. I guess I’m just a little nostalgic tonight. I can’t believe we’re here. I know it’s certainly not over yet — we’ve heard the first 12 months are definitely the hardest with multiples. But the past year was definitely a tough one and going back to work symbolizes the end of one chapter and the beginning of another, which is a major feat in my mind. My sister Jen came and visited last weekend. She got to see how big the babies have gotten since she was last here when they were born. We had a great time. The triplets are sleeping through the night!! I know…….amazing. They’ve consistently been sleeping 8 hours at time. Sometimes that starts at 10 p.m. (meaning a full night of rest for us), but unfortunately, sometimes it starts at 7:30 p.m. (meaning we still have to get up in the middle of the night). Either way, we’re thankful that their bodies have adjusted. The girls seem to get bigger every day. Even our parents who are around quite a bit comment that they get bigger every time they see them. I’d guess that they’re around 12 lbs. now. No check-up this month though — we’ll wait til next month to see. Despite the 1,200 bottles of hand sanitizer around our house, we did eventually get sick. It started with me and Hannah. I had it pretty bad — the classic cold. The triplets eventually caught it and we’ve been dealing with snotty noses, which makes for tough feedings since breathing is tough. Luckily, we’re past it now and flu/RSV season is winding down. We had our first non-doctor, non-baptism outings! That’s right — we packed up our house and headed over to my parents to celebrate my dad’s birthday last Sunday. Picture all of our diapers, bottles, outfits, bouncer seats, and blankets — the whole she-bang. 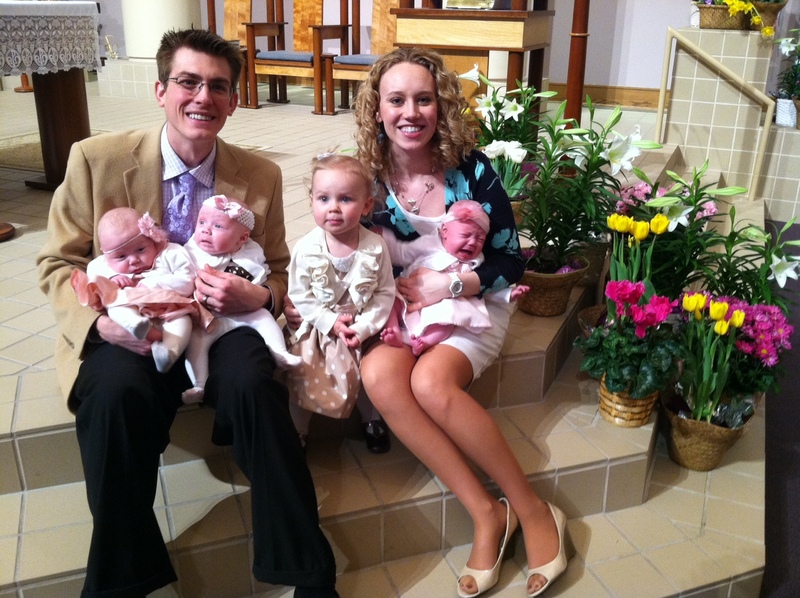 We also took the triplets to Mass last night. Since Hannah was spending the night at Grandma and Grandpa’s, we got a little ambitious and decided to try it. Of course, we sat in the very back, but the trip was a success. We planned it so it was between feedings, and the girls slept the whole time! 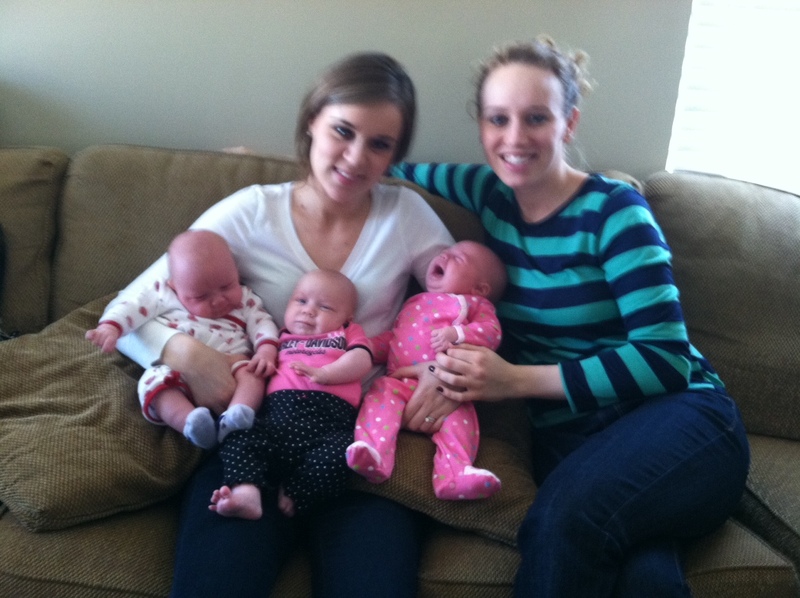 We enjoyed being able to go to church together and everyone enjoyed seeing the babies out and about. Being married to a sports fanatic, I’ve picked up on some of the lingo over the years. In basketball, a triple double refers to a player achieving double digit totals in three statistical categories. But in our household, it means the triplets have given us two reasons to celebrate in the same week. 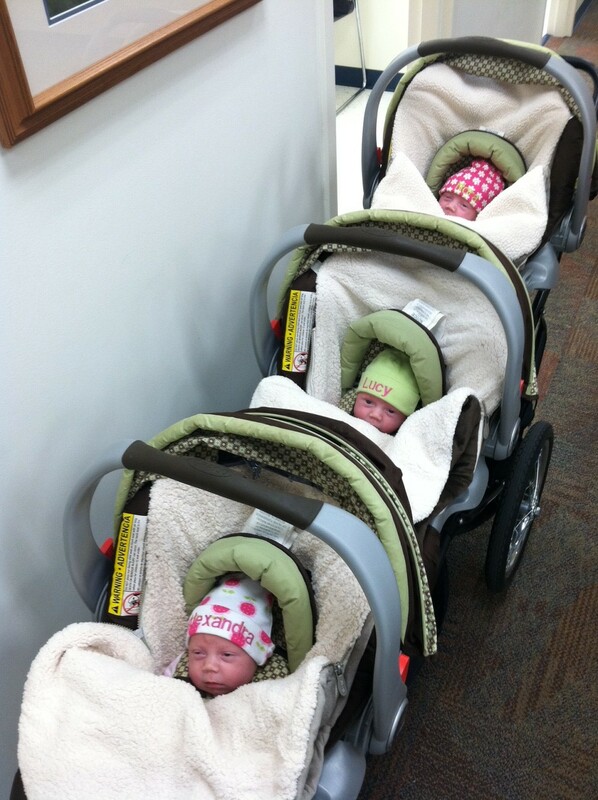 SUCCESS #1: At our 2-month appointment last week, the girls weighed in at a whopping 11 lbs (Alex), 10 lbs 13 oz (Nora), and 9 lbs 13 oz (Lucy). Alex and Nora are so big that their measurements don’t even fall on the preemie growth chart anymore! 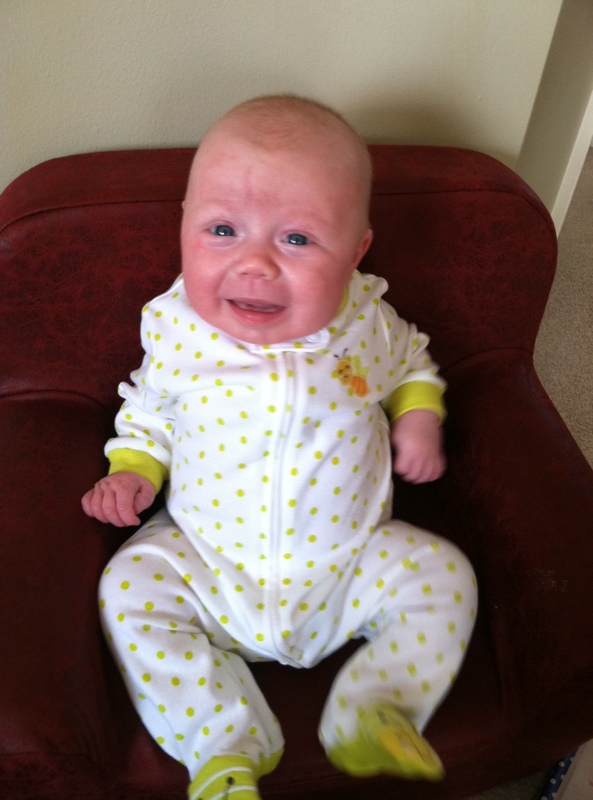 They are now in the 50th percentile for weight for full-term babies. This brings me to success #2. SUCCESS #2: We don’t have to be on special formula anymore! Since birth, the triplets have been on Similac Neosure, which is a high-calorie formula just for preemies to help them gain weight. Unfortunately, there are no generic versions of this particular formula, so we’ve been paying about $17 per 8 oz can. And when you go through one can in just a day and a half, the cost can add up. Luckily, stepping up to the next level of formula allows us to purchase the Kroger version, which only costs $13 for a can that’s three times that size! See what I mean? TRIPLE DOUBLE. Another big change we’ve experienced lately is Greg’s return to work last week. It was a short work week, however, due to two days off for President’s Day on Monday and a school cancellation on Friday because of the ice storm. So perhaps it was the best way to ease into being without him. Of course, now that he’s back to teaching full days, there’s no time for naps during the day like there was when he was on leave. So this means we’ve had to work out a more creative nighttime schedule: Greg takes the last feeding of the day while I head to bed. But I take the feeding in the middle of the night while he sleeps. So he might have to stay up later, but he gets uninterrupted sleep so he can be more alert at school. Been wondering where I’ve been? 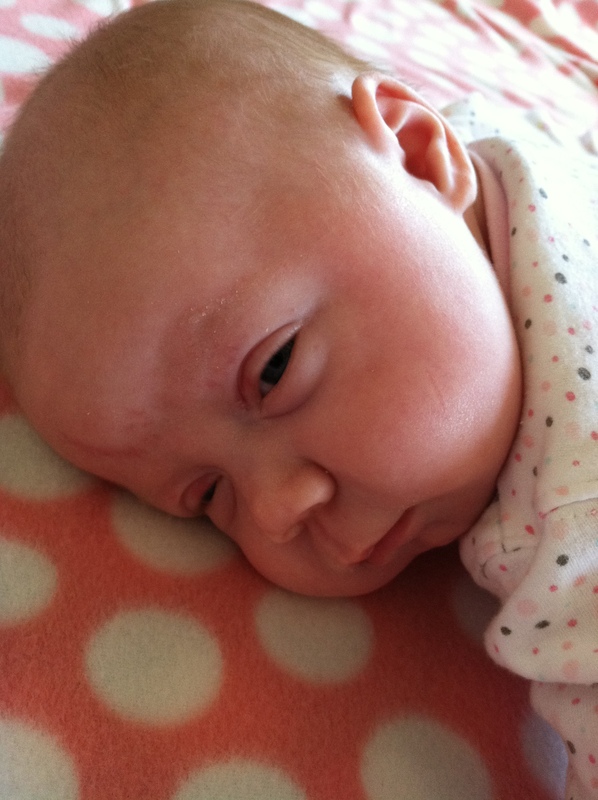 As predicted, the girls have started to become more awake as they’ve grown, and they now keep us on our toes 24/7. We use the times that they don’t require our attention just to catch up on basic necessities — taking showers, eating, getting some rest. Luckily, through the generosity of friends and family volunteers, we’ve still been able to find time to ourselves to go workout, grab a bite out, or run some errands. This doesn’t look too much like Calvary, does it?? 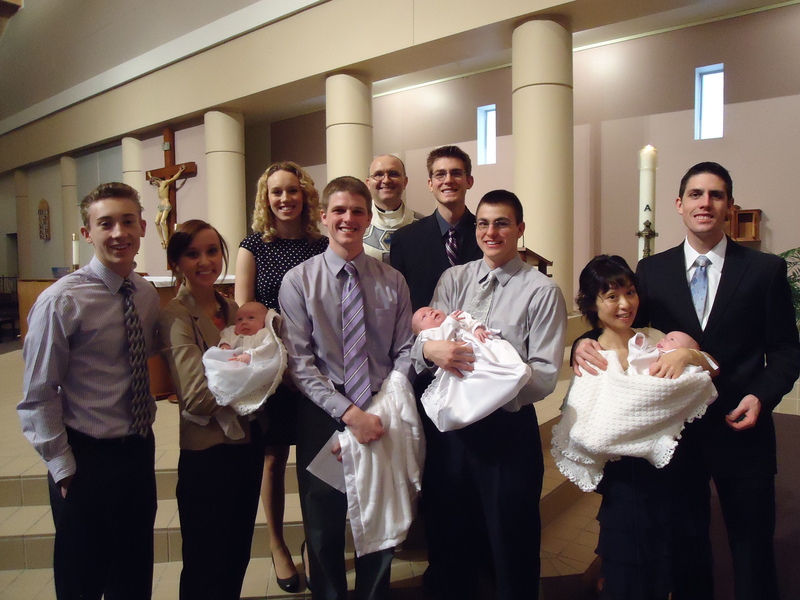 We were certainly proud to have our brothers and sisters up there as Godparents for our children. While the ceremony got a little noisy at times with babies fussing, it was still very special. Afterwards, we headed back to our house for a nice lunch with everyone. 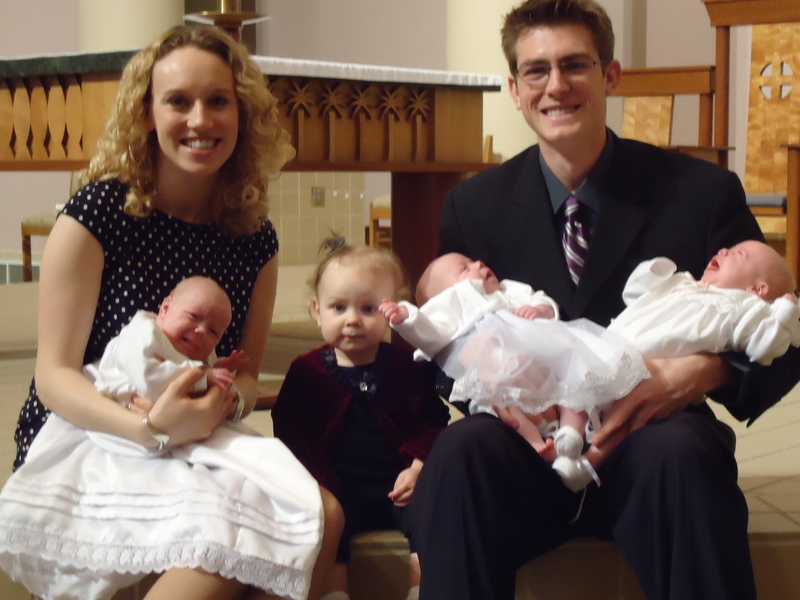 The girls received gifts like Miraculous Medals, a rosary, a scrapbook and photo albums, money, and prayer cards — all very special items that will remain keepsakes. While the day was a success (and my entire house now smells like Chrism oil), it probably goes without saying that we spent the day napping and relaxing after everyone left. Whew! 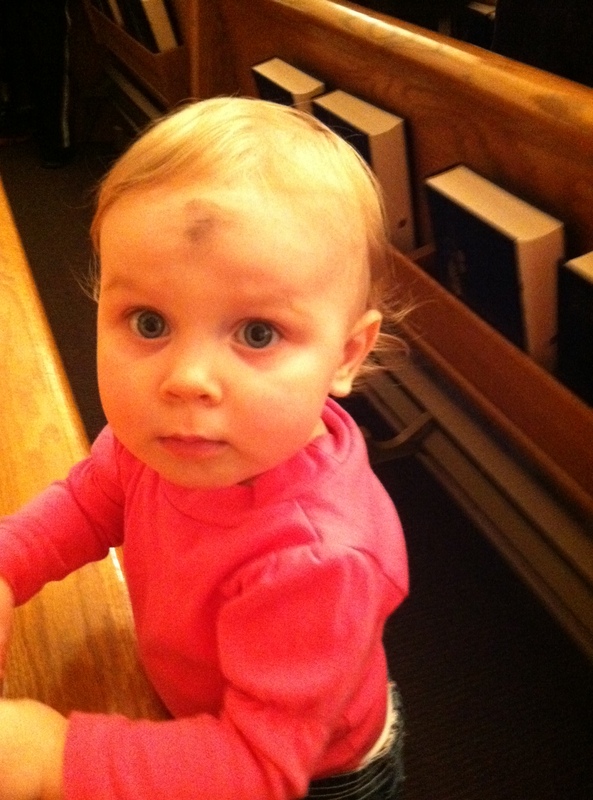 Hannah’s first ashes. What a good little Catholic girl! Despite the hectic week, the girls actually allowed us a very nice, quiet Valentine’s Day. We enjoyed a nice steak dinner together and exchanged funny cards (my preference). “No gifts,” you ask? Well, funny story — on his way up to the Northside for an eye appointment, Greg was listening to the Dan Dakich sports radio show to refute Dan’s claim that “you’re a schmuck if you don’t get your wife something for V-day.” Greg argued that having the added expense of triplets was a good excuse, correctly claiming that I had not asked for any gifts this year. Dan still protested (which makes sense — you’d think carrying around triplets for the past year would warrant extra gifts on Valentines Day 😉 ), but Greg forgot to mention that he was making me a nice dinner and told me to go on a shopping spree the following day. What a fun story! Greg was glowing the rest of the day. This weekend was also marked by a visit from my aunts who came up from Haubstadt to see the babies and try their hand at “triplet duty.” My mom, Aunt Amy, and Aunt Laura spent yesterday and this morning feeding babies, doing laundry, washing bottles, organizing baby clothes, playing with Hannah, and making meals. They’re Wonder Women to say the least! 🙂 What was I doing during all of this? Getting my hair done (I went shorter and darker!) and going shopping, of course. Greg even got out of the house for a bit to workout and do some things for himself. Many thanks for weekend off!! I’m very thankful for the help we’ve continued to receive lately. Greg’s parents come over one night every week to let us get a full night of uninterrupted sleep, while my parents remain”on call” throughout the week to quickly come over if we need them. Our siblings continue to be excellent aunts and uncles, stopping by to see Hannah and the babies every chance they get. And of course, our core group of volunteers still come by and offer their help any time we need it. I also wanted to extend one last thank you to YOU for continuing to read my blog. I’ve heard the nicest comments from some of you and I’m glad you enjoy reading it as much as I enjoy writing it. Thanks for being interested in our life and listening to me ramble!